Discuss your round thirteen moves. not too sure on what else bit sideways but good chance to sort the side out, not too fussed about the byes, Any thoughts??? Curious to know why you prefer the Hoff over Sicily? I perfer Westoff but Sicilys Def/Fwd status would be pretty handy..
Trade Coniglio to Gaff? Loving Gaff rn and really want him in but it will probably come at the expense of Cogs. Just a bit worried about his post-concussion games, give how Merrett played after his. Any idea? Gaff still needs to learn how to tackle IMO. Wouldn’t compare Merrett to Coniglio as Merrett couldn’t handle a tag. Coniglio will be fine and in regards to Gaff, from personal experience he is great besides he doesn’t tackle or can handle a tag. 1. Hibberd, Walters & Ridley > Burton, Wingard & Bryce-Jones and 40k for next week? 15 on the field this week. 2. Christensen, Walters & Hibberd > Westhoff, Burton & Bryce-Jones and 62k for next week? 16 on the field. Going by a suggestion someone made earlier and playing the breakevens this week. But would having 3 Port players in the forward line be too much. Westhoff, Gray & Rocky? Thoughts on trades and team for this week? I am bringing in Gaff this week for Guelfi. After the bye its either Nic Nat – Grundy, or Bont to Macrae. Need help deciding between the following 2 options. I know that Curnow is likely to outscore Yeo but also think that Austin/Doedee should go before Cunico. Any chance there’ll be news of Laird before the bounce tonight?! Seedsman will get another last chance, and lose some more $$, if Laird is out.. I highly doubt Laird will play this week mate, id say 80/20% he wont play. Seedsman will drop about $25K this week, but is a heartbeat on the field. 99/1% in my opinion. Cant see him playing. Remember when Seeds was a lock for top 6 DEF. Oh, they were happy days. I think that Adelaide, where they are on the ladder, will have to play Laird – broken hand and all. So I’m going to hold Laird and trade out Seedsman – as I think the injury that Seedsman had when he was a late withdrawal – the abdominal strain – is still lingering, and he is definitely losing cash… and Laird’s fitness isn’t in question, it’s just a widdle bwoken bone in his hand. Adelaide could play it overly cautious.. They took a risk with Sloane and they have suffered for that..
Option 1 – then you can loophole it with a better Captain score than the Hoff. Hold Dusty Martin still if he is named? If not, who should I trade him to? I was thinking Murray, ZGL and Banfield for Wingard, Wines and Wilson. Leaving me with $32K. It also still leaves me with Fogarty, Pittonet and Murphy who I all want to get rid of though. Does anyone know if there’s a loophole (partial lockout) for RDT ? 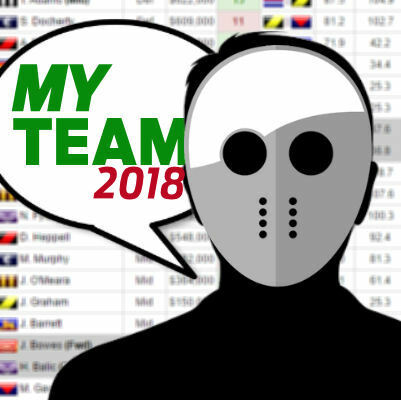 And as I’m still cutting my teeth on Supercoach – is that a rolling lockout always? a) Do faster contests and more open play mean higher fantasy scoring? i.e. Would it mean more +6s (mark/kick combo) than +4 (tackles) in tighter games…? b) I read that Danger et al. want the length of the game trimmed down to 100 minutes. Interesting how quickly people forget that the games used to be 25 minutes + time on in a quarter, and now they are only 20 minutes + time on… So question is: If the footy players want shorter games can we then have more of them… e.g. a 34 round season where everyone plays everyone else twice? Imagine the fantasy season going that long!!! Okay, with my team I need to trade Laird, Phillips and Ah Chee this week to field 18 this week and field 18 next week. Thoughts would be great please? I could actually get Ryan from WCE instead of Kerr, would that be better and make option 3 the go to move? I’d go 1 but only just over 2. Avoiding two Port trades lets you wait for Friday teams. You say you have to but it’s a pity about Phillips, he has plenty of money to make. Fantasy site just crashed on me. I think my carnage has got to it! Phillips > Curnow leaving 92k or do I go Mutch > Gaff leaving 9k. Any other trade ideas are welcome, thanks. Hey mate – id go phillips to Curnow. better bank for next week (still important), Curnow decent run ahead, can still grab Gaff next week (reports are mutch killed it in 2s, ?more chance to come back and make more coin then phillips). Which two to field of these three? Rice, Austin and Doedee? Don’t know whether I can trust Wingard so thinking of getting a rookie (despite being pretty expensive) instead to bank some cash for next week? I’m in the same boat. If I get DBJ I can get to Curnow, but can only get to Gaff if I get Yeo. Gaff and Yeo is a killer combo mad fish…pull that trigger! DBJ still going to need to be traded before end of year, Gaff and Yeo aren’t missing games any more! So after my bye plans got thrown out the window by good rookies being dropped (Murray, T.Smith, E.Phillips,…Billings), inopportune injuries (Laird, Coniglio, Pearce) and dusty having a mid-season break to freshen up for his bender planned for the bye weekend I have just managed to scrape together 18 on field again for the 2nd week running. Shame to kick Zerrett, but not 100% convinced he is top line mid for rest of season now with increased focus with heppell being out for a bit, whereas Gaff is looking top 10 and McLean is must have fwd line. 76k. After reversing my trades countless times, I think i’ve come to my final decision for trades this week. This leaves 17 on field this week. Need to trade out Seedsman, losing way too much $ and has the bye next week which I’m heavy on. Hopefully Brander can stay in the side for a month or so… Patty Wilson looks to be the popular rookie this week and should stay in Adelaide’s depleted side if they get a win. Finally trading Mutch > Curnow who is the best premo I can get IMO. Clarke should come in over Mutch next week for the bombers having 38 disposals and 11 tackles in the VFL. This will also leave me with 15 on field before trades next week, 16 if Clarke is named. 50k I can use and aim to get Kelly in next week. Quite long but i’d appreciate other’s opinions on the trades/plan, good luck with the rest of the byes.